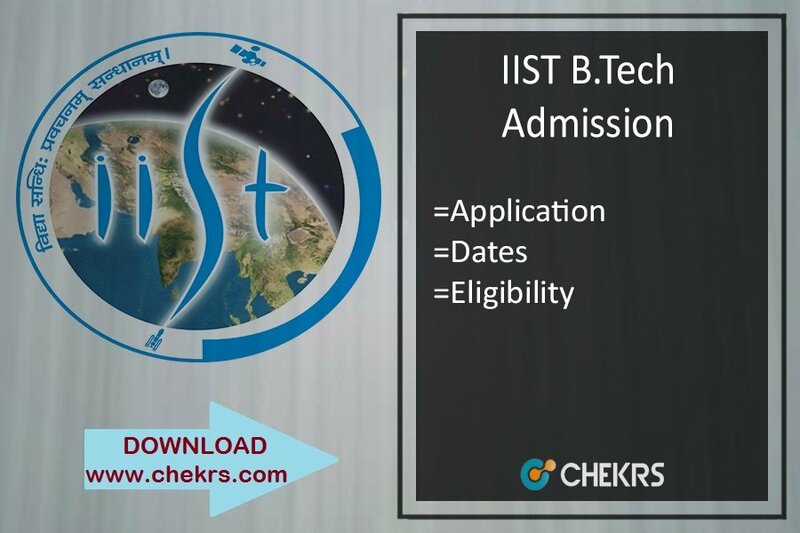 IIST BTech Admissions 2019 : The Indian Institute of Space Science and Technology (IIST) located at Thiruvananthapuram. IIST is a deemed university comes under the department of space and Govt. of India. Latest Update: For B.Tech Admission, Brochure will be released on 07th May 2019. Latest Update: IIST Admission Notification for B.Tech, M.Tech, and Ph.D. has been Released!! check in the table below. IIST Institute provides high-quality manpower to the Indian Space Research Organization. It is the one of the world’s leading scientific organization under the Govt. of India. The aspirants who are interested to get admission can apply for the IIST Admission Form 2019. The IIST B.Tech Admission opens for UG engineering courses for those who hold a desired to pursue their education in space engineering. The students who will qualify the JEE Main and Advanced will be eligible for the IIST BTech Admission 2019. IIST Application form is a platform to reach and take admission in Indian Institute of Space Science and Technology. The aspirants interested and eligible can apply for the form and they must note that they have to fill all the important details in the desired places. Students can fill the IIST B.Tech Admission Application Form 2019 by using mode of online. The application form is available in Indian Institute of Space Science and Technology website. Steps for filling IIST B.Tech Admission 2019 Application Form. Candidates need to follow the IIST official Website Apply Here . Students have to log on the official website and click to apply online. Aspirants have to register their JEE Mains and JEE Advance roll no to apply online. Candidates entered a valid email and go to next process. Now fill the all mandatory and compulsory entries carefully. Download printout out of bank challan and pay the application fee. Students must read the again filled application carefully if ok then go to final submission. Candidates take a print out of fill application fee for the future use. Reserved category candidates will pay amount Rs. 300/- to apply online. IIST is a deemed university that offered education in engineering for undergraduate course program. Indian Institute of Space Science and Technology is one the best college in India. The Institute provides education specialized in Space Science and technology. Students must have the nationality of Indian Country otherwise, cannot apply for admission in IIST. Aspirants should be passed intermediate or higher secondary class with subject physics, chemistry, and mathematics with minimum 70 % aggregate. Candidate must be passed or good rank in Joint Entrance Exam Advanced (JEE Advance). Reservation candidates should be passed in higher secondary or 12th class standard with physics, chemistry, and mathematics minimum 60% aggregate. Indian Institute of Space Science and Technology offered courses for undergraduate students. There are 120 seats available for four years under course program. Students can select easily any one course to do education in engineering. The available IIST Seats available are given below students can choose anyone. Counseling process for undergraduate students will be conducted by Indian Institute of Space Science and Technology on the mount of July 2019. Counseling process will be based on Joint Entrance Examination JEE mains and advance. The IIST Counselling procedure will be based on counseling dates and JEE rank card. There will be merit list in two or three round. If students are not found their name in first merit list then wait to next round merit list. For more information about IIST Result 2019, you can follow the notification link above or you may contact us by commenting at the end of the post.